Brian Cant provided all the narration, and sang all the songs in Trumpton, Chigley, and Camberwick Green. His other major credits include Playschool, Playaway and Dappledown Farm, and he has also been involved in many pantomimes and stage shows. Here Gareth Randall (he's the one on the left!) interviews Brian, and asks him about his involvement in the earlier years of children's television. 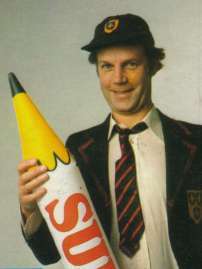 Who is Brian Cant, and where does he come from? I come from Ipswich in Suffolk. My Dad was an engineer; there was nobody in the family who had any connection with showbiz except for my mother's father who was a roller-skater on the halls. He used to go round the music halls doing his skating act on a tiny little portable rink; the only thing I know about him is that there's a sepia photograph of him doing a pirouette, and on the back there's a message to my grandmother saying something like "Hello dear, I'm playing Colchester next week and hope to send you some money!" I used to go and watch the Ipswich Theatre and started joining in a bit, helping, and then I began doing amateur work around Ipswich. I used to watch all the old music hall stars - Max Miller and all the rest at the local Hippodrome - and I went to all the summer shows at Felixstowe and Clacton and just got the feeling that I wanted to do this. Oddly enough I never did drama at school - I was too shy! The desire to perform came very late upon me. How did you get into television? Via the stage, really. I moved to London in the trade that I was in, which was printing; I was a lithographic artist in a fine art shop in Ipswich. When I arrived in London I went to work at the Mountview Theatre Club, which was an amateur place but also housed a lot of professionals who were there just keeping themselves going - doing it for nothing because they wanted to act. I was doing a play there when an agent came in and asked if I'd like to audition for a summer season; I went along, got the part, gave up my printing job the next day, which reduced my wages by two-thirds, and went off to do a summer season thinking that it might be the only professional acting job I ever got. I was a Penguin Player - our company was called the Penguins - and we took over at Peterborough for two years of solid repertory work, which was my training ground. Eventually I moved on to other rep companies until I got an introduction, through a guy called Dennis "Slim" Ramsden, who was a wonderful farceur, to a director at the BBC. Dennis told him that I was looking for work, and I ended up doing a small part in a TV play about the army. I was a prisoner of war had to give signals by skipping with a rope and singing nursery rhymes - obviously the shape of things to come! I was in six episodes of that, which was nice, and moved on to small parts in lots of other things - Doctor Who, Dixon of Dock Green, Danger Man... I was in two Doctor Who's. In one I was annihilated by a Dalek and in the other I was annihilated by a Quark! The Quark story was called "The Dominators", I think, and it's now out on video, so suddenly I'm getting little repeat fees dropping through the door, which is always pleasant! I actually watched it recently. No-one sent it to me and I hadn't seen it at the time, so I went and bought it. I appeared in the third episode; the door opens and in comes this young man who looks like my son, Richard, who's in the business now. All this hair and sideburns... it was extraordinary! Then, of course, I get annihilated, and I had a pipe up my skirt to give the effect; there was a guy under the table with a smoke gun, and when the little Quark, which was a schoolboy in a polystyrene box, stuck his arm out, the man under the desk pumped some smoke through the pipe and it came out of your neck! Apparently, they've recently discovered a bit of film that had been lost in the vaults, that shows me in the Dalek story - I can't remember what it was called, but it was with William Hartnell's Doctor. I'm on this alien planet, and I'm wearing a beard - you can almost see the glue that's stuck it on, it's terrible... all these little bits from the past keeping popping back into my life! TV nostalgia is big business these days. It seems to be. Of late, there's been an awful lot of contact with me to talk about Play School, Play Away and the rest, as if everyone's bemoaning the fate of television. It's just that the latest crop of producers and directors remember that period fondly and realise that some of us are still alive! How did you get involved with Play School? Was children's programming a vocation for you, or was it just a job? Just a job! I'd heard that it was happening - BBC-2 was gearing up to launch - and I was working with a lady called Cynthia Felgate who was later to become the producer of Play School and Play Away among many others. I was doing a schools drama which she happened to be working on. We had a chat and she said that she was creating a programme called Play School, which was aimed at the under-fives. I simply said "Oh, how do I audition?" and that was that! I auditioned, got it, and was in at the beginning. I stayed for about eighteen years; I think it ran for twenty-one. Play School led to the Trumptonshire programmes, Play Away and the rest, and gradually the other, more serious work I'd been doing alongside them dried up. A lot of people assumed that I was tied exclusively to the BBC for their children's programmes, because even though I only did so many each year, the shows were scheduled in such a way as to make me seemto be everywhere all the time! When it all finished, it took a long time for me to make my way back into drama - I do mostly theatre these days. In Play School, how much was script and how much was improvisation? It was always mostly scripted, and at the beginning it was very heavily scripted. As they got to know what we could do, there would be bracketed areas in the script saying "Brian does bird" or "Eric does tree" and they left it to us to work something out, but even in the heavily-scripted days we would change things to make them our own. Eventually I realised that I could supply material and I ended up writing whole programmes, sometimes whole weeks of programmes, and as it went on it became easier to reuse themes, nursery rhymes, stories and the rest. Did you have much input into the format of the show? None to start with. The format was already there; they wanted a programme aimed at the single child at home, so you were working eyeball-to-eyeball. I think that was why it was so successful; whoever you were talking to, you had to make them feel that they were the only one, that you were doing it just for them, and so there were all sorts of guidelines we had to follow. We were never allowed to say "ask your mother/father" because they might not have a mum or dad, so you'd say "ask a grown-up" or "ask an adult", and you couldn't talk about going to play on the lawn, because there'd be lots of children in high-rise blocks who didn't have gardens, so you'd talk about playing in the park. What was the production schedule? Initially it was shot on film in black-and-white at Lime Grove, and there were no opportunities for retakes - we had to plough straight through. We worked a week in advance of transmission, and used to record the whole weeks' worth of programmes in two-and-a-half days, shooting one show in the morning and another in the afternoon. When we moved to being on twice a day, some people thought that the first show was live and the second was a recording of the first, but that wasn't the case - we were never live. The nearest we came to it was the film days at Lime Grove; once we switched to videotape at Television Centre, we were able to do retakes if we had to. How did you become involved in the Trumptonshire programmes? It simply followed on from my association with Play School; I was asked if I wanted to do the voices. I had no input into the stories or formats at all. I used to go along to Freddie Phillips' house and sit in his cupboard, which was his recording studio, and Gordon Murray would give me the script. Gordon would go through it with me, saying "Leave a pause of one... leave a pause of two.... leave a pause of three there, one there, run that straight on..." and that's what I'd do. I might change the odd word here and there if it didn't flow easily, but that was all. Gordon himself had been at the BBC for years before Play School, and I don't know much more about him. I never saw the puppets or the filming for any of the shows - I had no idea what any of them looked like! I was working simply from their written descriptions and by what they said. These days they all sound basically alike, but at the time I thought I was doing heavy character stuff! I would do roughly three shows in a day. It was quite tiring work, especially the songs. Obviously we only ever recorded the songs once, but I wasn't a trained singer and so Freddie's range was limited when it came to composing them. 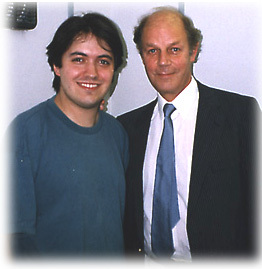 Trying to get me to do a high note in his broom cupboard was quite tricky! It wouldn't have been a problem on stage, where you're projecting, but trying to hit the high notes while staying close to the microphone was difficult. I've still not seen all of the original programmes. In fact, I saw one just the other day that I'd never seen in its final form; it's the one where Cuthbert goes and feeds the ducks in the park when he ought to be on duty. Many of the phrases from the shows are now part of the language. Do you still remember them all? Oh yes! Recently I was called to do a voice-over for the Red Bull drink, and out of this huge long script my only line was "Pugh, Pugh, Barney McGrew, Cuthbert, Dibble, Grubb" - I was in and out in ten minutes! I found myself suggesting alternative deliveries and we did several different takes; I don't know what they ended up using. I also did a commercial for Windmill Bread. Two young guys at an advertising agency called me in, sat me down, gave me the script and said "Read a bit of that". I read it, and one of them walked away saying "Oh Christ!". I thought "Uh-oh" and asked what the problem was, and he said "I can't believe it - it's just how it sounded on the original! "; he'd been afraid that it might not! The final ads were lovely things. Gordon Murray was called in to remount, build the puppets and sets and shoot them. They were full of anarchic bits; Mrs. Honeyman had tasted somebody else's bread and her head fell off, someone got strung up on the sails of the windmill and all his clothes blew off... we made about six of them, but at the last moment the bread was taken off the market and the ads got shelved. Do you know if any of the original puppets still exist? Gordon kept absolutely everything up until a short while ago, when he set fire to the lot of it. He didn't want the puppets and sets to be used, sold and messed about with, so he made a bonfire of them. I'd have loved a few of those! How much involvement have you had with the various recent commercial spin-offs from the programmes you worked on? I get nothing from the Trumptonshire videos, because I was paid a flat rate for my original voice sessions. Of course, at the time I signed the contract no-one could have foreseen the advent of home video, less still the massive cult success of the shows, so being paid royalties never entered the equation. I also got nothing from the "Trip to Trumpton" record that was in the charts a few years back, even though they used a sample of my voice. They didn't ask me for permission; in fact they didn't have to, because Freddie Phillips owns the copyright on those recordings. I tried to see if Equity could help, but with no luck. People kept coming up to me and saying "You must be doing all right, number six in the charts! ", but I got nothing. I was asked if I wanted to link the Play School "Re-Play" video. The silly thing was that the guy who was producing it knew nothing about Play School, so I had to feed him ideas! He didn't know about the windows, what happened on each day of the week, the toys, nothing! I had to steer him through it. For example, I suggested that he'd find lots of different versions of the same songs or rhymes that he could cut together, and that they'd all match because we all sang in the same key. As it turned out, there didn't seem to be as much available as he or I thought; a lot of it's been junked. What was it like working with a live audience on Play Away? I was always against the idea of a live audience, especially one full of children. Edward Barnes took over as head of children's programmes at the BBC and insisted on it. The idea was that when we were off on our own planet doing all the nonsense they could come with us, but the reality was that we'd end up cutting to a bored audience who'd been asked to watch the same sketch three times, and then sit there with a warm-up man talking to them while we changed sets and costumes. It just kills the mood. You can't expect them to react the same way every time they watch the same silly joke that will only bear doing once to an audience that's ready for it... I generally enjoyed Play Away, but it don't think it worked as well as some of the other things we did. In fact, Play Away was originally mooted as a Saturday Play School, but aimed at a slightly older audience. There wasn't even a single joke written into the first one! There was a factual film about making steel hawsers for ships, and a sequence in which we all went up on Primrose Hill and flew kites - that was where I went out on a limb and ad-libbed a joke about fly-paper being the best type of paper to make kites from. They didn't seem keen, but they left it in. It didn't get a laugh, but we didn't have a studio audience at that time anyway. Somehow Play Away caught on and it just snowballed, evolving into a family entertainment show until we had writers like Maurice Gran and Lawrence Marks and some guy who went on to do Not The Nine O'Clock News... people who'd probably rather forget that they ever had anything to do with us! We had a big audience of adults watching on their own, because they'd seen the first film on Saturday afternoon and were too lazy to get up and switch off or switch over until the next film came on. The only problem was that because Play Away was lodged between two feature films it never seemed to have a regular time slot, and it often ended up clashing with the football results on BBC-1 - so we'd have sackloads of letters from irate children whose parents had insisted on watching the results programme! Many of the programmes you worked on have come from what many people view as the "golden era" of children's programmes. Why do you think so many people look on it in that way? Do you feel that television in general has evolved or regressed since your time? Technically it's evolved beyond all recognition, and that can only be for the better. I think people are frightened to do anything gentle, though; we still see the likes of Tony Hart from time to time, and "Art Attack" on ITV which my children enjoy - they watch it, and then go off and make and do things as a result. But on the whole there seem to very few programmes that actually talk to you and give you something interesting to look at. There's so much gunge, this stupid gunge they insist on putting in every show now, and the cost of it... I would imagine that a gallon of gunge costs about as much as our total budget for all the props we had on Play Away! And I can't see what's funny about gunge. A custard pie can be funny, because it evolved from the stage and there was always a reason for it to be there, it would be putting down pomposity and it would be built nicely, and it would make you laugh... but gunge doesn't make me laugh at all, and my kids don't see the attraction either. You just know that someone's going to get covered in cr*p, and for what reason? There doesn't seem to need to be a reason any more, it just happens for the sake of it. Presenters don't seem to be able to stand still any more, either. They have to lunge towards camera all the time so you get this hugely distorted face, and then they jump back and lunge in again... not being able to stand still was always the sign of an amateur on stage, along with rocking from one leg to another; it makes you look weak and uncertain. I was talking to someone not long ago who said that what Play School and Play Away used to do was invite you in to take part in what was happening, while a lot of television now drives you away and forces you to sit back from the screen. Do you have any plans to move back into children's television? Well, ironically enough, I could end up deposing the programme that deposed Play School! When the BBC started working to the government-enforced rule that about twenty-five percent of its programmes had to be made independently, Play School's slot was offered up and replaced by Play Days. Now Play Days' slot is up for grabs, and I'm part of one of the bids that's made it through to the final three. If we get it, I'll be appearing in a weekly spot, so it'll be a mixture of the next millenium and the past - I'm hoping that it will happen, because if it does I'll be back to try and entertain the next generation!